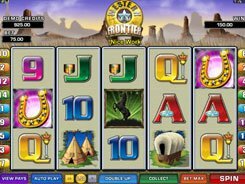 This 5-reel 15-line slot from Microgaming will transport you back to the Wild West. On the reels you will encounter playing card symbols, wagons, mustangs, teepees, and other related icons that create an immersive atmosphere of the American Frontier. 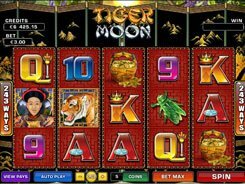 The slot is equipped with a wild symbol, a scatter, free spins, and the top prize of $3000. 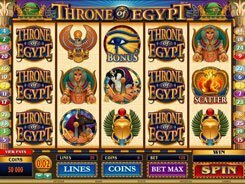 Before any spin you can adjust your bet configuring a coin size ($0.01 to $0.5), the number of coins per line (1 to 10), and the number of active lines. Overall, your total wager can be anywhere between $0.15 and $75 with all paylines enabled. A wild symbol is the Mustang that substitutes for other regular symbols. 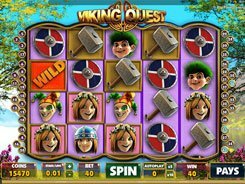 The Horseshoe acts as a scatter, with three or more activating 8 free spins, during which all wins with the wild symbol are doubled. What’s more, each Mustang that lands on the reels during the free spins adds to the meter. 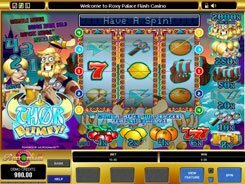 At the end of the feature, you will be awarded extra free spins (up to 16 at up to a x6 multiplier) depending on how many Mustangs have been collected throughout the feature.